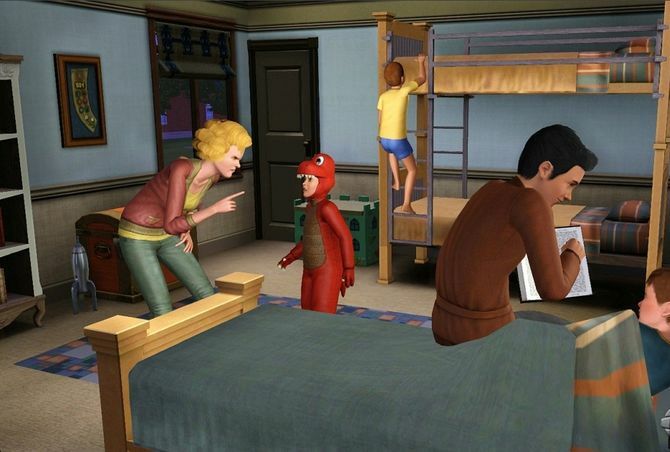 The Sims 3: Generations is the fourth expansion pack for The Sims 3. The game was released on May 31, 2011. It contains elements of The Sims 2: Celebration Stuff, The Sims 2: Family Fun Stuff, The Sims: House Party, The Sims 2: Teen Style Stuff, The Sims 2: FreeTime, and The Sims 2: University. Each life phase has a theme. For children, imagination and make-believe are key themes. For teens, rebellious, chaotic scenes such as parties and pranks are an addition. As a young adult and adult, the focus is on their relationships with others, from getting married to having children of their own. Elders get to enjoy their time reminiscing about the golden years and the joys of watching their grandchildren grow up. There are also now 5 schools (including Military school, Prep School and Art School) for Children and Teenagers to go to. The Sims 3: Generations (c) Electronic Arts Inc.
\Game\Bin dir, i.e. the install dir of the main game. install dir of the addon.